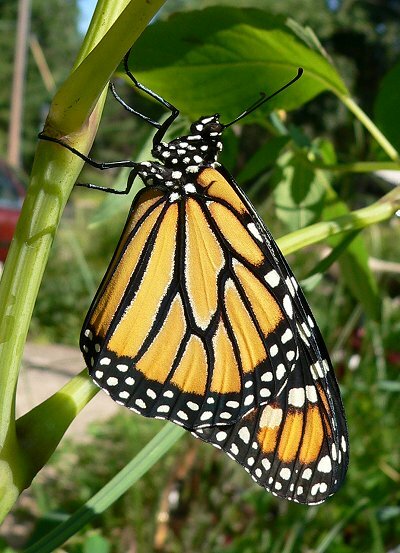 I begin finding Monarchs in our part of Wisconsin in late May, and see the last ones migrate through sometime in October. 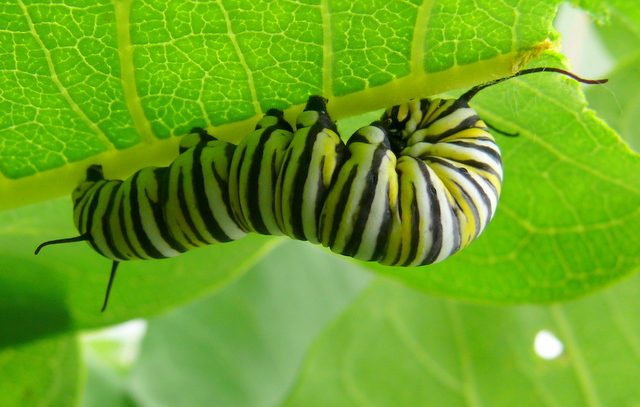 Monarch caterpillars eat only Milkweed (Asclepias spp.) 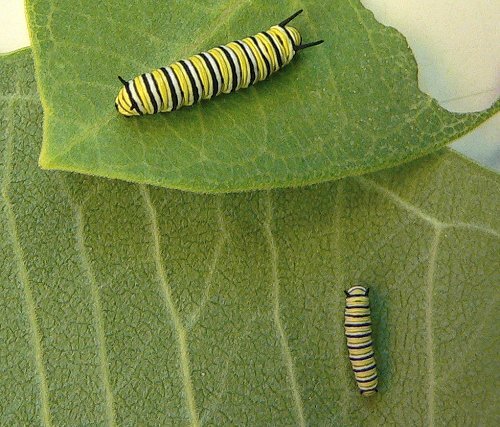 There are many species of milkweed in our area but I usually find Monarch eggs and caterpillars on Common Milkweed. 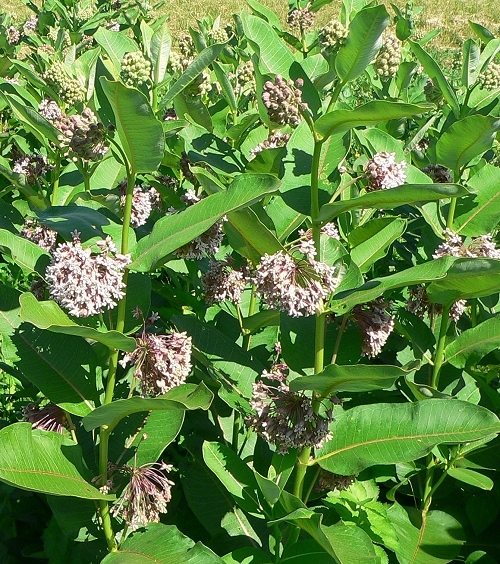 It has large flat leaves that are easy to check for eggs, and it's common in waste places and wetlands. 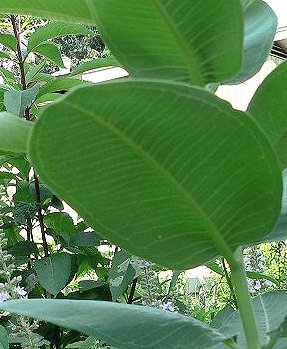 The eggs are laid either on the underside of larger leaves, or on new leaves or flower buds at the very top of the plant. 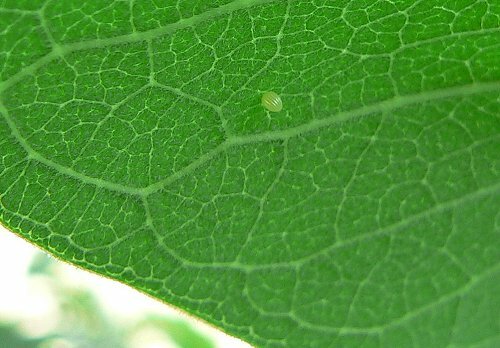 Here's an egg on the underside of a leaf - it's the light spot on the largest leaf. The eggs hatch within a few days. Here's a newly hatched caterpillar - about 1/4 inch long. 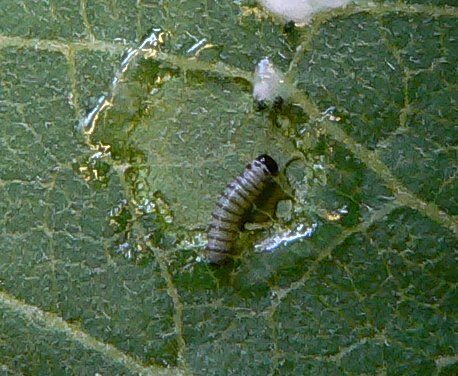 The caterpillar usually eats its egg shell, and then a tiny hole in the leaf, just where the egg was. Finding a small hole in a leaf is a good clue that there's a caterpillar close by. After about 10 days of eating, the caterpillar makes a chrysalis. 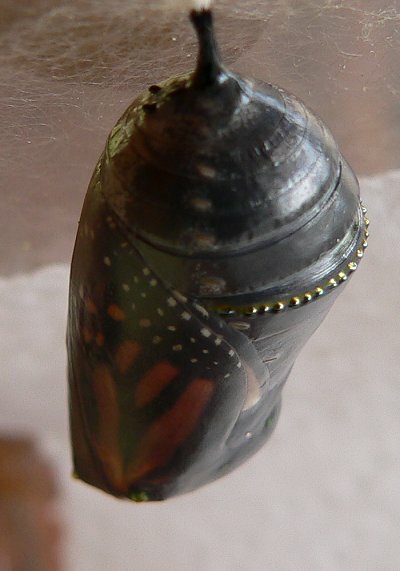 This one is in the process of forming its chrysalis. The silky threads are on the inside of the jar - holding the caterpillar firmly to the glass. 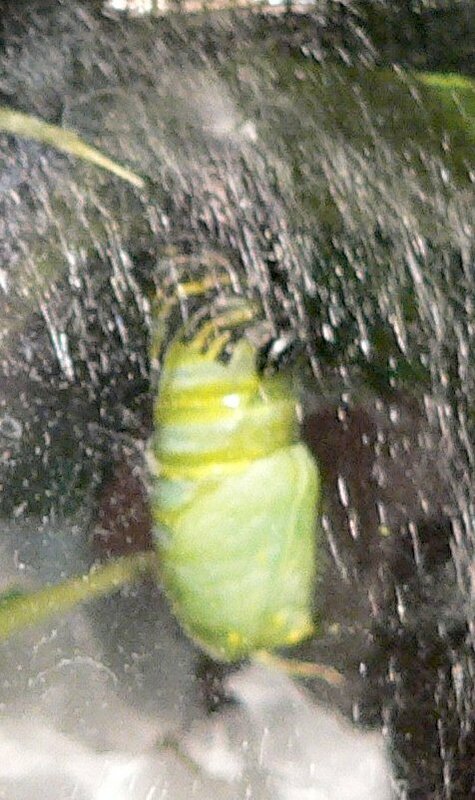 In about 10 days, the chrysalis is ready to hatch. 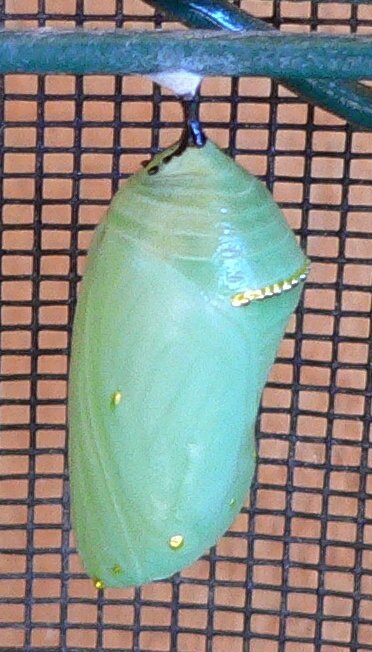 Several hours before it hatches, the butterfly starts to become visible inside the chrysalis. 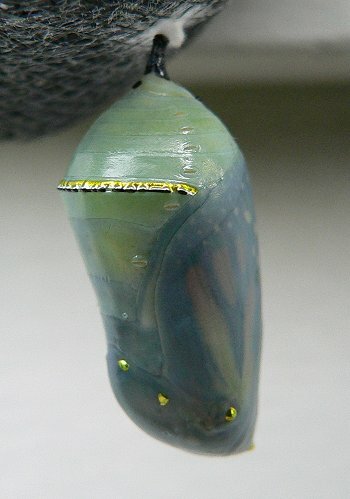 This chrysalis is almost ready to hatch. 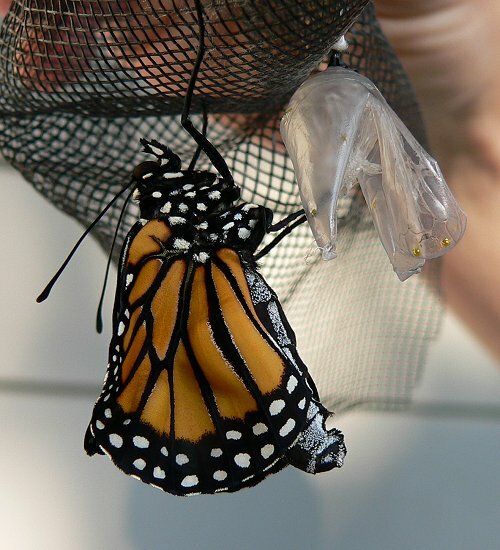 This entry was posted on Sunday, February 22nd, 2009 at 12:12 pm	and is filed under Butterflies, Lepidoptera. You can follow any responses to this entry through the RSS 2.0 feed. Both comments and pings are currently closed.